A goat chowed down on pizza at Famous Famiglia on Wednesday night. MIDTOWN — When it comes to pizza, this goat wasn't kidding around. The animal was spotted chowing down on a jumbo slice of pizza at Famous Famiglia restaurant in Midtown Wednesday night about 11 p.m. The goat, which was with a dark-haired couple, propped his two front hooves on top of their table while the woman fed it from her slice, which appeared to have spinach on it. It wasn't immediately clear whether the couple brought the animal in as part of a stunt or an advertising ploy. A crowd quickly gathered outside Famous Famiglia's floor-to-ceiling windows on the bustling corner of 50th Street and Broadway to snap photos. The farm animal, which was about the size of a large dog, appeared to be wearing a leash and had a red satchel around its neck. 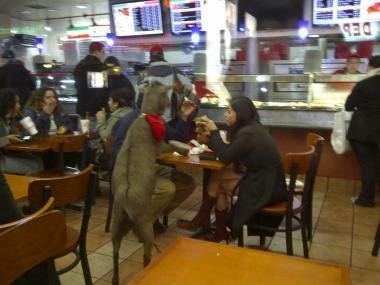 A goat ate pizza at Famous Famiglia on 50th and Broadway Wednesday night. "Maybe it's a service animal," said one man. "It could be a seeing-eye goat," joked another. 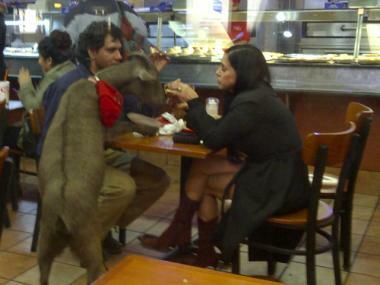 Despite the attention, the couple continued to enjoy their meal and remained focused on their four-legged third wheel. "I don't know who let the goats in because we normally don't even let dogs in, but it's big news around the pizza joint," said Famous Famiglia worker Lona Asaneni Thursday. DNAinfo's tweeted photo of the goat quickly went viral and attracted international media attention. The pizzeria has played host to famous visitors before. It's the same restaurant where Donald Trump and Sarah Palin held their "pizza summit" in 2011. Twyla Reynolds, 32, said she wasn't grossed out by the fact that she was eating pizza in the same place where a goat had noshed the night before. “I mean, maybe he likes the pizza. I think it’s fine as long as its not goat cheese pizza — that’s weird,” Reynolds said. Other residents didn’t think it would be so sanitary to have a goat dining next to them. Aside from being a foodie, the goat was apparently a law-breaker. "Pets are not allowed in food service establishments unless a patron needs a service dog, which the patron must identify as such," a Health Department spokeswoman said. "Service animals do not need a special license." Famous Famiglia won't be cited for serving the animal because a restaurant inspector didn't witness the goat eating the pizza, the spokeswoman said.